Given a set of members in hierarchical order, returns that set with its visual totals. In the visual totals, the actual value for any higher-level member is replaced with the sum of the values for the children that are included in the query. set_expression is an expression that evaluates to a set of members. This set can include members at different levels within the same dimension but the members should be in hierarchical order. optional_parent_name_pattern is a string that includes an asterisk (*) in the place where the parent name is to be used. For example: "SUB *" or "* (SUBTOTAL)"
If you omit this, no extra strings are added to the parent names. This query shows the patient count for each of the listed ZIP codes and cities. The patient count for each ZIP code is the total patient count for that ZIP code. In this case, the patient count for any higher-level members (the ZIP codes) reflects only the children that are included in the query. 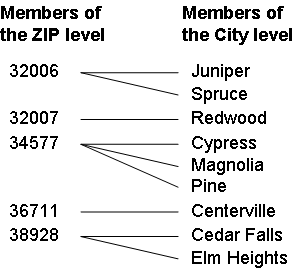 For example, the patient count for ZIP code 34577 is the sum of the patient counts for the cities of Pine and Cypress. The values shown are the same as in the preceding query, but each ZIP code is shown with the trailing string (included cities).